Unfortunately Mother Nature is at it again with a severe weather and tornado threat today. 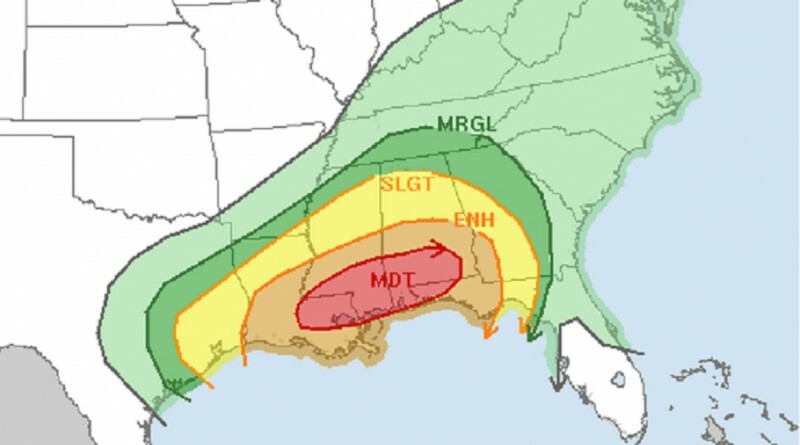 The Storm Prediction Center (SPC) has issued a Moderate Risk for parts of LA, MS, AL, and the FL Panhandle. Metro areas that are impacted include: New Orleans, and Baton Rouge Louisiana Mobile, Prichard, Enterprise, and Montgomery Alabama, and Hattiesburg and Jackson Mississippi and Columbus, Georgia. 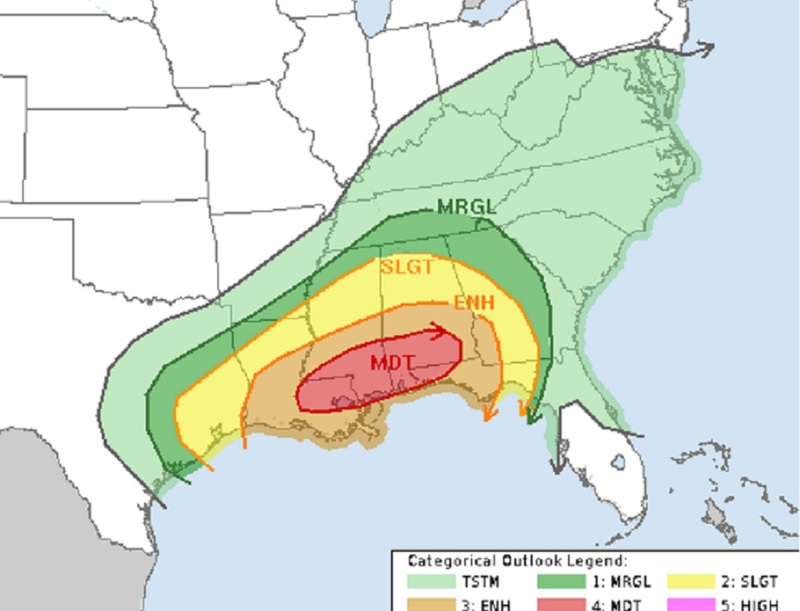 There is an Enhanced Risk of severe weather and tornadoes also including parts of southwestern Georgia and a Slight Risk extending into parts of Southeastern Texas. The outlooks are all based on how concentrated the severe weather reports are expected to be– they have nothing to do with the expected intensity of the storms. What the potential intensity of the storms has to do with is the specific combination of atmospheric parameters such as: wind shear, buoyancy, ascent, and a boundaries (e.g. fronts). 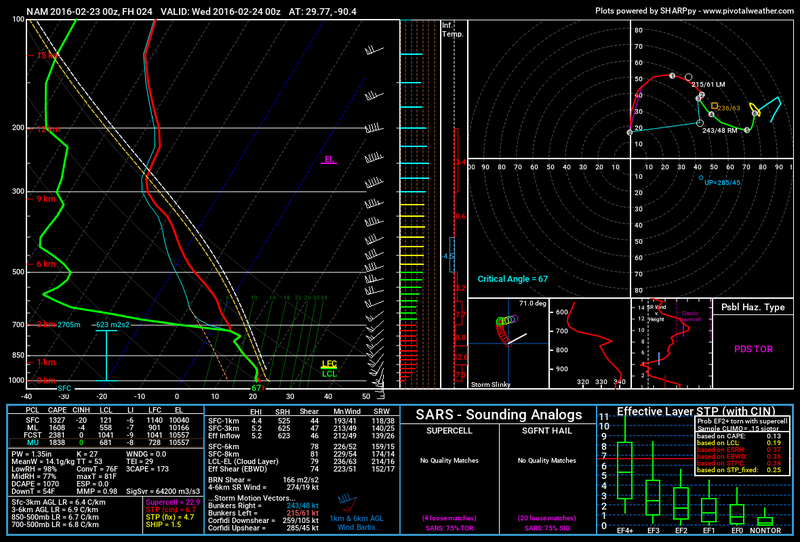 Here’s the 00z NAM forecast sounding and Hodograph for near New Orleans, Lousianna at 7pm central, it indicates a Particularly Dangerous Situation or PDS tornado threat. For an in-depth list of forecasting tools and resources, click here. 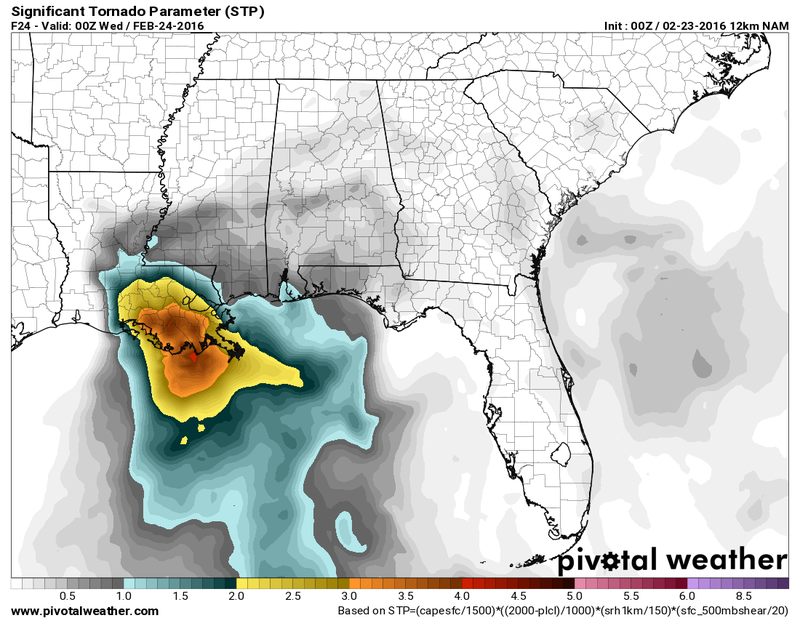 Unfortunately for those in the the Southeastern US today, the conditions look favorable for strong tornadoes and the chance of nighttime tornadoes exists today as well. 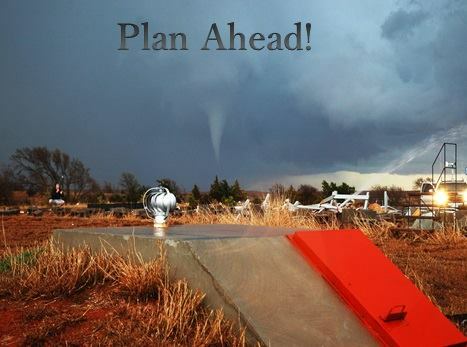 If you haven’t already, make sure to have your tornado sheltering plan in place! Charge your batteries on your NOAA weather radios and stay tuned to local tv/ radio stations for weather alerts. Remember: a Tornado Watch means conditions are favorable for tornadoes to form, Tornado Warning means a tornado is occurring and to seek shelter immediately. Basehunters will be live-streaming from Mississippi today at http://www.severestudios.com/livechase.